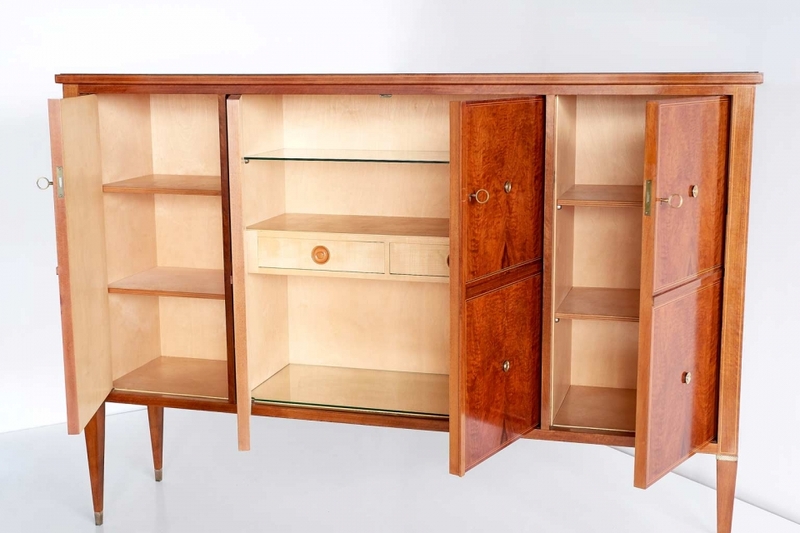 This large four-door panelled cabinet was designed by Paolo Buffa in the early 1950s. The composition of the striking grain of the eight mahogany veneered panels and the decorative brass details give the cabinet a refined and elegant appearance. The design is completed by the solid walnut tapered legs with brass sabots and a brown colored glass top. The cabinet has two single doors and one double, with a key for each. The maple interior has four wooden shelves, one glass shelf and two drawers. One of the doors has been brandmarked with “Esposizioni Permanente Mobili Cantu”.